Lower Canyon - Looking down on the lower portion Tuber Canyon. Bypass Trail - A section of the trail that bypasses the lower spring. Lower Spring #1 - Looking down at the trees growing in the lower spring. Lower Spring #2 - Looking back towards the lower spring. Hill and Trees - Vegetation poking up from wash below hill. Upper Canyon - Looking up toward the top of the canyon from the five mile point. Desert Paintbrush - Bright red petals of common wildflower. Canyon Mouth - Bottom of canyon. Near end of road. BLM Sign - Restoration sign blocking vehicular traffic. Canyon Road - Open road as it drops into mouth of canyon. Mines to South - Mines south of Tuber Canyon. Lilac Sunbonnet - Common wildflowers. Very small, but attractive. Panamint Daisy #1 - Rare daisies growing in unnamed canyon south of Tuber. Panamint Daisy #2 - The unnamed canyon is north of Jail Canyon. Panamint Daisy #3 - There was a pretty decent population in this canyon. Panamint Daisy #4 - Another look at this rare desert wildflower. Mine Tunnels - Very old mines located a mile or so up unnamed canyon. Trails - Looking down from ridge south of Tuber on old roads and/or trails. Low Cryptantha - Cryptantha humilis growing at a lower elevation than expected. Mine Site - Old ore processing structures near bottom of Tuber Canyon. Panamint Daisy #1 - Enceliopsis covillei of the Sunflower Family. Forget-Me-Not - Cryptantha tumulosa of the Borage Family. Lupine #1 - Most likely Lupinus flavoculatus of the Pea Family. Lupine #2 - For over two miles along the route there was lots of lupine! Beardtongue - Penstemon fruticiformis of the Figwort Family. Rowland Cabin - Once an Adopt-A-Cabin project, this cabin is now difficult to access due to road closure. Wood Burning Stove - Very nice stove inside the dilapidated cabin. Rock Wall - Old wall structure below the cabin in Hall Canyon. Wooden Fence - Fence on both sides of creek below cabin. Indian Ranch - Looking down on Indian Ranch through glare of late afternoon sun. Lilac Sunbonnet - Lots of this. I had to watch my step not to step on the stuff! Lupine #3 - I've never seen so much lupine in a desert environment. Panamint Daisy #2 - Several healthy plants spotted on this hike. Witch's Hair - Odd tangle of dodder on a small bush. Sierra Sunset - Nice view of snowy mountain peaks of the Sierra Nevada Range. 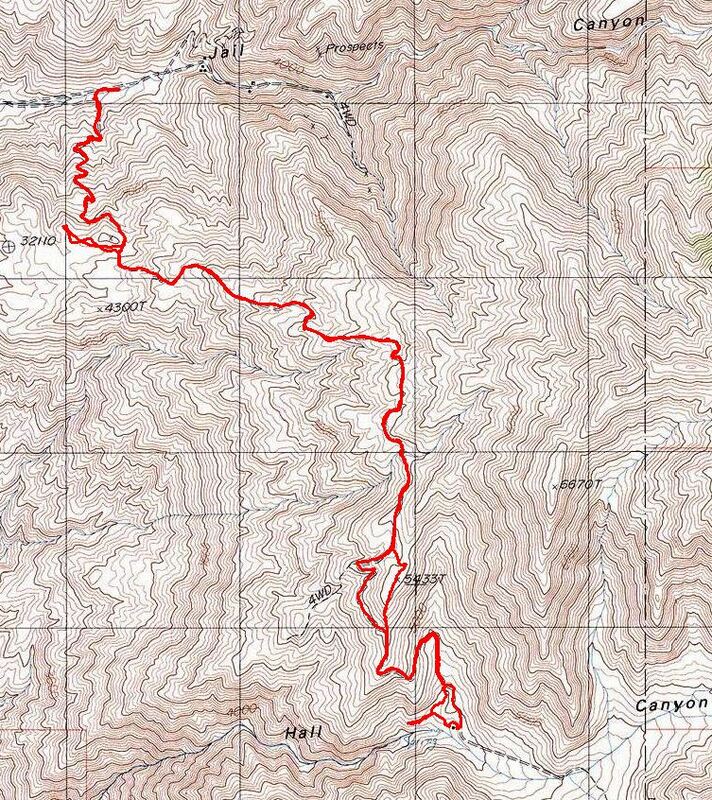 Route Map - Ten miles round trip with 3700' gain/loss. Video at YouTube - It's called "Flowers in the Desert" and features lots of flowers! Telescope - Telescope Peak above Hall Canyon. Indian Ranch - Clump of trees and buildings from the dirt road near gate. Mistletoe #1 - Mesquite tree hosting clumps of mistletoe. Fence #1 - Old fence south of lake. Fence #2 - Another view of old fence looking north toward Indian Ranch. Lake and Ranch #1 - Looking north toward the mouth of Jail Canyon. Lake and Ranch #2 - More of a focus on Indian Ranch in this photograph. Snowy Ridges - Looking south toward snow-covered ridges above Pleasant and South Park. Mistletoe #2 - Another mesquite tree with mistletoe growing on it. Mistletoe Berries - Cluster of white berries growing on mistletoe plant. Valley View - Looking north up Panamint Valley from ridge above Jail Canyon. Hall Road - The road continuing towards Hall Canyon can be seen in the center of the picture. End of Road - Looking down on Jail Canyon toward end of road. Road Block - The first 500 yards of road out of Jail to Hall contains many obstacles. Road Sign - Sign in Jail Canyon blocking road to Hall Canyon. Jail Truck - Yellow truck at end of road in Jail. Jail Trees - Large trees in Jail Canyon above mining relics. Shack #1 - A shack a little ways up Jail Canyon. Panamint Dudleya - Succulent growing on rock wall in Jail Canyon. Shack #2 - Bunk bed and rock sticking out of side of shack. Shack #3 - Something tells me that the rock isn't decorative. Scorpion - This guy was atleast four inches long. Panamint Daisy #1 - Flower of Panamint Daisy. Panamint Daisy #2 - Plants at 4100 feet overlooking Jail Canyon. YouTube Video - Video with footage of Panamint Daisies taken above Jail Canyon. Junk Car - Junk car near some foundations just outside Tuber Canyon. Mining Facilities #1 - Remnants of mining operations in Tuber Canyon. Canyon Mouth - View looking down toward mouth of Tuber Canyon from mine site. Mining Facilities #2 - Another view of mine operation remnants. Cabin Ruins - Remains of a cabin just below mining facilities. Panamint Daisy - A daisy plant next to road near bottom of Tuber Canyon. Salt Cedar - Shrubby tree growing near spring in canyon. Donkey Head - A partially decomposed head of a donkey. Most of the rest of it was nearby! Dense Growth - Dense vegetation growing along stream near bottom of the canyon. Lady Bug - Lady bug hanging out on plant near stream. More Vegetation - The stream near the bottom of the canyon is a little over a half mile long. Spring Number Two - This small spring is a mile or so up from the first spring. Panamint Penstemon - Some flowers growing near spring number two. Another View of Two - To get around spring number two, go to the south. A washout impedes progress on the other side. Lilac Sunbonnet #1 - Small, but very pretty flowers along the route up the canyon. Lilac Sunbonnet #2 - I only came across one patch of these little beauties on this trip. Primrose - A primrose plant near the second spring. Prickly Poppy - A prickly poppy blooming near the second spring. Hedgehog Cactus #1 - Large pink blossom of a hedgehog cactus. Rattlesnake - A rattlesnake disappearing into some bushes. I didn't get my camera out fast enough to get the whole thing and I decided against pursuing it into the bushes!!! View Up Canyon - Looking up toward the third spring and beyond. Lupine - The grape soda smell emanating from these guys was quite distinctive. Indigo Bush - A look at the intricate branch structure of this bush. Stream Orchid #1 - A stream orchid specimen at the third spring. Stream Orchid #2 - Another specimen at the third spring. Spring Number Three - The elevation of this spring is 4800 feet. View Up Canyon - A view looking up the canyon from 4900 feet (just beyond the third spring). Hedgehog #2 - A close look at a flower. Hedgehog #3 - A cactus plant with a few flowers growing near the third spring. Brooklime - An American Brooklime plant growing in the stream below a spring. End Of Road - Looking up ridge from end of road. South Fork - Looking up south fork of canyon. Telescope - View from just above bend in canyon. Map of Canyon - Map showing approximate location of old road.